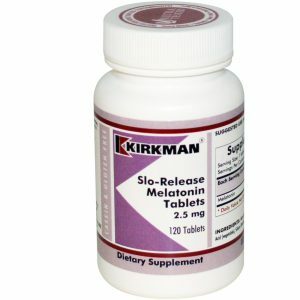 View cart “Slo-Release Melatonin 2.5 mg Tablets” has been added to your cart. This is a hypo-allergenic formulation specially designed for individuals with special requirements and sensitivities. There are no artificial flavourings or sweeteners added. This product can also be added to hot water to make a very pleasant tea or can be added to your favourite commercial tea resulting in a nice citrus note. Adults and children will find using this product a great way to supplement magnesium. As with all magnesium supplements, stools can become looser with use. If this occurs, cut back on the dosage. – Magnesium relaxes nerve impulses and muscle contractions. – Magnesium promotes relaxation and, in the process, may aid in restful sleep. Signs and symptoms of magnesium deficiency can include fatigue, mental confusion, heart disturbances, irritability, weakness, muscle spasms, loss of appetite, insomnia or a feeling of weakness. The Physician's Desk Reference for Nutritional Supplements states that recent data of inpatient and outpatient populations suggests that magnesium deficits may exist in from 12% to 40% of individuals. There are many different forms of magnesium, and the Physician's Desk Reference for Nutritional Supplements states that there is no compelling data indicating absorption differences. There are reported differences in how different forms affect the gastrointestinal tract, however. Below are some guidelines, though individual results may vary and should be discussed with your physician before administration. Sugar, starch, soy, wheat, casein, gluten, milk, preservatives, yeast, gelatin, artificial flavourings or colourings, peanuts, tree nuts or fish. 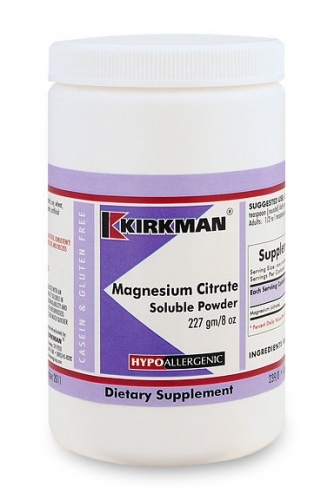 MAGNESIUM CITRATE SOLUBLE POWDER IS FORMULATED WITH AN ANHYDROUS FORM OF MAGNESIUM CITRATE MAKING IT SOLUBLE IN WATER AND OTHER WATER BASED LIQUIDS. AFTER POWDER IS MIXED IN THE LIQUID, LET MIXTURE SIT FOR 15 MINUTES AND REMIX TO MAXIMIZE SOLUBILITY. THE BIOAVAILABILITY AND ABSORPTION OF THIS FORM OF MAGNESIUM WILL BE UNSURPASSED. THE CALMING QUALITIES OF MAGNESIUM WILL BE SEEN MUCH QUICKER THAN WITH OTHER FORMS OF MAGNESIUM. BOWEL HABITS. IF THIS OCCURS, DISCONTINUE USE AND DISCUSS THIS MATTER WITH YOUR PHYSICIAN.